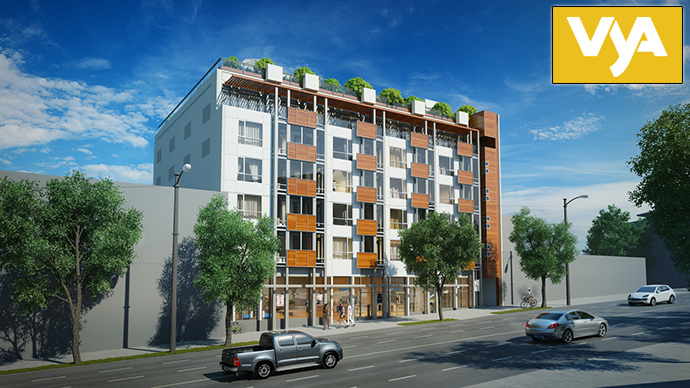 Featuring a Mount Pleasant Vancouver original, this is a celebration of modern aesthetic architecture and design by Robert Ciccozzi Architecture who has combined the incredible and beautiful elements from the historic district into this six storey mixed use development. With faux wood balcony spandrels (that are defined by a cedar plank look’ with steel beams, this mid-block façade is both intriguing as it is beautiful and timeless. The VyaLiving Vancouver condos in Mount Pleasant also feature oversized floor to ceiling windows in addition to expansive patios and roof decks depending on your floor plan. Nearly 90% of the homes provide some sort of outdoor living space for residents. 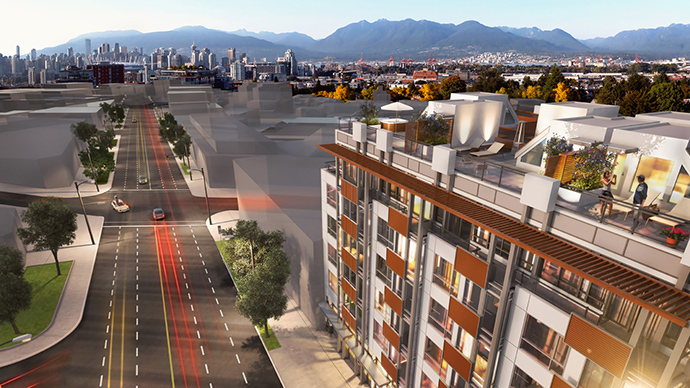 In addition, the VyaLiving Vancouver condos are centrally located in the heart of the city, at the nexus of Kingsway and Broadway where you will find the best transit routes to get you everywhere in the Lower Mainland. 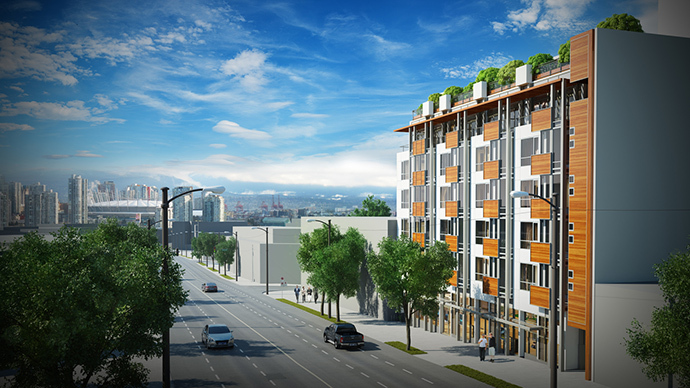 As well, the East Vancouver VyaLiving condos will feature a two level elevated courtyard that is called the Amenity Deck at Vya where you will find a BBQ, fire pit, green space, comfortable seating area and some urban agriculture plots. Other common amenity spaces on-site include a clubhouse lounge with fireplace and kitchen that is great for entertaining. All homes come with the comprehensive 2/5/10 home warranty by National Home Warranty and there is secured underground parking as well as visitor parking. The front lobby entrance has an enterphone and the common areas are secured with restricted FOB access. More information about the Mount Pleasant VyaLiving condos is online at www.vyaliving.com. There are 2 designer selected colour schemes called Vya Light or Vya Dark. These new Mount Pleasant Vancouver condos also come with polished chrome entry fixtures, durable engineered hardwood floors and custom five inch baseboards. They are also finished with two inch white faux wood blinds and come with full sized front loading Whirlpool washer and dryer. The kitchens at the Vya Living Condos in Vancouver’s Mount Pleasant neighbourhood will come with efficient and beautiful open concept kitchens, modern high gloss flat panel cabinetry in Grey or White as well as premium quartz stone counters with glass tiled backsplashes. The kitchens also come with sleek square profile faucet by Moen and square profile under mount single bowl sink in stainless steel. The appliances are stainless steel as well and will include a Fisher&Paykel counter depth fridge/freezer, KitchenAid slide in range with convection oven, energy saving ultra quiet dishwasher by KitchenAid and a KitchenAid microwave hood fan combo unit. The presales Vancouver Vya Living Condos will also come with modern pendant light over the island and under cabinetry task lights. The beautiful bathrooms at the Vya Living Vancouver condos include in floor radiant heating, sleek square profile fixtures by Moen, quartz counters with under mount square sink in all bathrooms in addition to clean lined square profile accessories and glass accent tile in the bathtub and shower surrounds.